It’s A Boy For Jon and Tracey! Last month my husband and I welcomed a very special delivery from Farm Sanctuary. We were honored by having two awesome rescue sheep named after us!! Jon and Tracey were rescued from a neglected home in Upstate New York along with their friend, Louise. 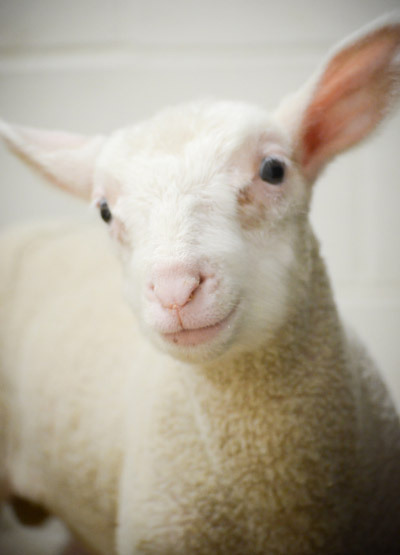 And as if being part of Farm Sanctuary’s family wasn’t gift enough, Tracey had a little lamb! 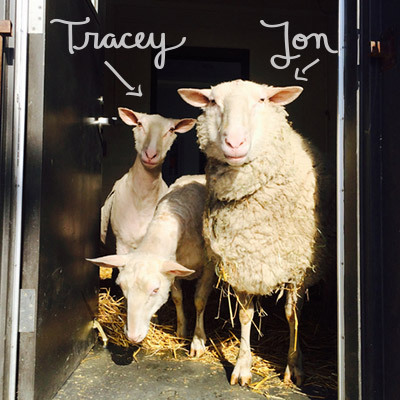 Below is the story of Tracey's lamb, Hazelton, as recounted on the Farm Sanctuary blog. 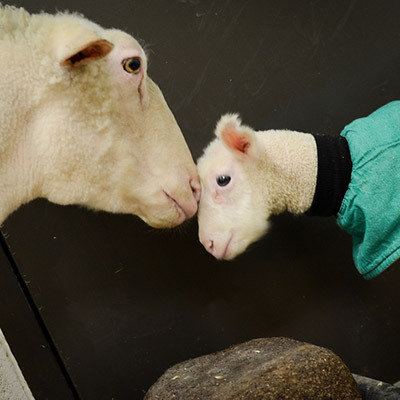 The year of the sheep began on Feb. 19, but we were celebrating two days early at our New York Shelter when new lamb Hazelton finally began nursing. We had been anxious for the little guy and his mother, Tracey, ever since Tracey went into labor with him four days before. We had monitored Tracey night and day for weeks awaiting this birth, knowing that it was high-risk because of her advanced age and history of neglect. Caregivers were by her side as soon as her difficult labor began and helped her through every moment. When Hazelton finally entered the world, it was love at first sight for Tracey, and for us. As overjoyed as we were to welcome Hazelton, we were also anxious for him. His heartbeat was racing, his respiration was high, and he was unable to nurse. Further complicating matters was bone-chilling weather. Mama Tracey braved subzero temperatures and wind chill during what has been one of New York State’s worst recent winter. And Hazelton – without much muscle or fat to keep him warm – would endure the same. He was suited up in not one, but two coats to keep him warm and protected. For four days, staff kept constant watch over him, putting in long hours and rearranging schedules to make sure he had the help he needed. Caregivers performed regular diagnostics and tube-fed him every six hours — a delicate procedure demanding expertise and great care. 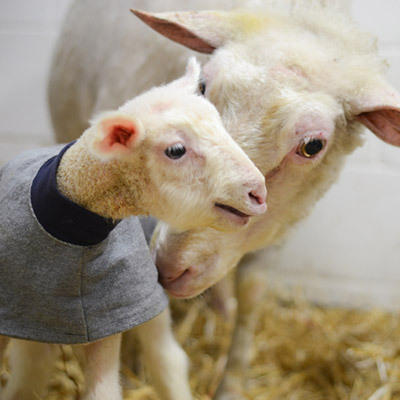 The whole shelter pulled together to help this lamb, and when, on day four, he finally began to nurse, we breathed a collective sigh of relief. Our little friend isn’t out of the woods yet, but this development is a very good sign. Without the know-how and tireless dedication of our staff, neither Hazelton nor Tracey would have survived. Nothing short of round-the-clock care and monitoring by experienced caregivers could have saved them. That quality of care is extremely rare. It cannot be found on any commercial farm, and it was certainly unavailable to Tracey before her rescue. When we welcomed Tracey and her friend Louise to the shelter, they were emaciated and crawling with lice. Having gone years without proper food, water, and care, the two pregnant ewes were nearing the end of their endurance. We knew that getting them healthy was crucial not only to improve their well-being but also to reduce the danger posed by their impending deliveries. In addition to treating Tracey and Louise for their parasites and carefully helping them gain weight, we gave the ewes a rare mid-winter haircut. Clearing away the extra wool helped us monitor their udders as their deliveries approached (and we continue to monitor Louise, whose twins are due soon). At this time of year, it’s too cold for these skinny sheep to be outside without full coats of wool, so they have been convalescing in two cozy stalls inside our Melrose Small Animal Hospital. Here, we can also protect Hazelton and his soon-to-arrive playmates from the winter temperatures, which would likely cause fatal hypothermia if they were living in a barn. This little family is so appreciative of their newfound comfort and especially of each other. Tracey adores Hazelton and cannot stop grooming and doting on him. In the beginning, she was a little distrustful of us, unsure of our intentions for her son. Now that she’s seen we only want to help, she adores us too. This mama has a lot of love to give. Many people worked long hours, experienced nerve-wracking moments, and lost more than a little sleep helping one little lamb get his start. Now that one little lamb has a whole, big life to live and so many people to touch. Bringing the animals of the farm into your own home. Bring the Farm Sanctuary into your own home. I grew up in Northern NJ (living out West presently). It’s really uplifting to know that Farm Sanctuary exists. I hope that your message and good will spreads and others learn the valuable lessons your work for animals has to teach. Thank you for your dear hearts…can only make the world a better place.